Cheyne Section Sea Fishing Mark is a rugged mark lying on Portland’s eastern flank that provides some excellent sport throughout the summer and autumn. It is a flood tide venue that offers fi shing from lofty ledges some 40 feet above the sea, but it is also possible to scramble down to the water’s edge near the old pipe at the access point. This is a noted mark for producing some really big fish. Expect ballan wrasse to 7lb, corkwing wrasse, pollack and many mini species by day. When darkness falls the real heavyweights appear. Conger eels to more than 40lb have been taken, along with big rockling, occasional bull huss and a few double-figure bass. Ragworms will pick up lots of smaller wrasse and pollack, but for the big fish switch to peeler crabs, hermit crabs or a good chunk of a velvet swimming crab. 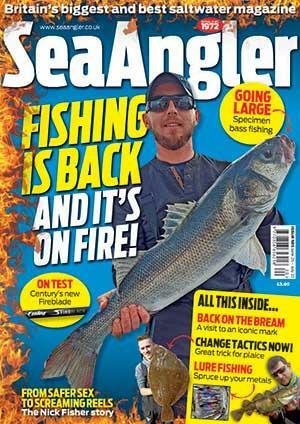 For the conger eels and bass use a big mackerel bait. Rockling will take a peeler crab or smaller fish baits. A fairly robust rod and reel are required with the latter loaded with 25-30lb line straight through, along with a rotten-bottom system on your lead weight. Stick to a one hook rig. A size 2/0 or 3/0 short-shank, wide gape hook is normally used for the bigger wrasse, while a size 6/0 Pennell is favoured for the conger eels and bass. If you want lots of bites and smaller species, switch to a size 2 hook. hundred yards to the south.